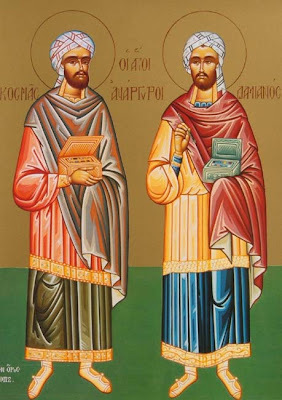 "There are three pairs of holy physicians by the name of Cosmas and Damian. The first entered into rest peacefully on November 1, the second pair was stoned in Rome on July 1, and the third was from Arabia; and it is these that we speak of under today's date. They were physicians by profession, and when they received the Christian Faith, they healed the sick in the name of the Lord Jesus Christ. They became widely known for their miraculous healings. The malicious pagans seized them, and took them before Governor Lysias in the town of Aegea. Since neither of these brothers would renounce Christ at any cost, they were cast into the sea, then into fire, but the omnipotent God saved them from both the water and the fire. An angel of the Lord appeared to them and saved them. The pagan governor ascribed this to their alleged sorcery but they answered: ``We know nothing of sorcery nor do we need sorcery, but we possess the power of Christ-which saves us and all who invoke His Most-holy Name.'' The pagans struck them with stones but the stones bounced off them; they shot them with arrows, but the arrows rebounded as well. Finally, they were beheaded with the sword. 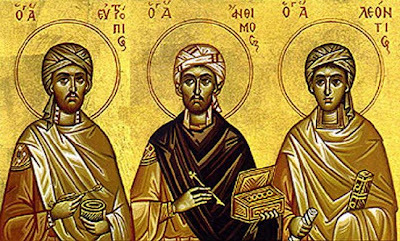 Saints Leontius, Anthimus and Eutropius [who were their brothers] also suffered with them, and received heavenly wreaths of glory. They suffered in the time of Diocletian and Maximian. Many miracles were manifested from their holy relics, even as miracles abounded from them during their life." "Τῇ αὐτῇ ἡμέρᾳ, Μνήμη τῶν Ἁγίων αὐταδέλφων Μαρτύρων καὶ Ἀναργύρων, Κοσμᾶ καὶ Δαμιανοῦ, Λεοντίου, Ἀνθίμου, καὶ Εὐτροπίου. Ἀνθοῦσι λαμπρὸν καὶ πανευπρεπὲς μάλα." O Holy Unmercenaries, intercede for us and help us!